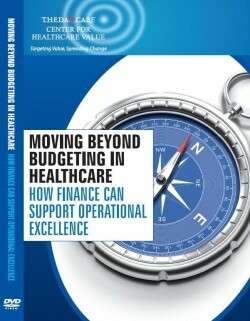 How finance can support operational excellence. Available for on-demand viewing. 25-minute video that shows a more effective way of financial planning. As healthcare organizations streamline their care delivery process through the elimination of waste and the application of operational excellence principles, they are finding that much of the time spent creating and adjusting the annual budget is wasted time. This 25-minute video examines two healthcare organizations that have moved away from creating annual budgets to a more effective way of financial planning. At ThedaCare, you will meet Brian McGinnis, VP of Finance at Thedacare, who manages the corporate quarterly forecast process. Brian describes the advantages of using the financial team’s valuable time to consult with business managers to help them optimize their finances instead of working with them to create an annual budget. We also speak with David Cooke, former CFO at Park Nicollet Health, about what they gained after eliminating the budget process. To give us the financial professional perspective, we discuss the concept of Beyond Budgeting with Steve Player, Director of the North American Beyond Budgeting Round Table. Mr. Player describes the process of breaking down an organization’s financial processes to find waste, the 12 Beyond Budgeting principles and the key reasons why you should stop creating your annual budget. The target audience for this video is CFO’s, controllers, directors of financial planning and accounting, senior leadership team members, and lean implementation leaders. 4. Why Eliminate the Budget? We also offer educational workshops on this and other transformational learning opportunities. Here is our calendar. In order to creating better services and products for our customers, the need to change our organizations is essential; and the ability to create a thriving and improvement-orientated culture is the cornerstone to such an organization. Moving Beyond Budgeting in Healthcare gives you the roadmap to improve the financial culture needed to achieve these changes. The right financial planning and cash flow is the business lifeblood underpinning any organization and its improvement culture.